This dish gives me fond memories of my early 20’s, when my best friend and I used to go to Panic every Tuesday. I’d go over to her flat after university and get dressed up, swigging on a glass (or three) of Pinot Grigio while she made us dinner. With no regard for other peoples' sense of smell, we’d load the pesto with virtually a whole bulb of garlic, wolf down our meal and jump in a taxi to Central London. Amazingly, the pungency of our meal did nothing to reduce our pulling power! It works best with homemade pesto which you can make in advance (there is no need to be as trigger-happy with the garlic as we were! ), and the balsamic-roasted tomatoes complement the flavours beautifully. Turn the oven on to 180°C and line a 20cm baking tray or cake tin with foil (make sure it’s fully covered – you don’t want balsamic vinegar all over the tin!) and place your cherry tomatoes in the tin. Drizzle with about a tablespoon and a half of balsamic vinegar. Put in the oven for about 30-40 minutes, shaking them occasionally to keep coated with balsamic. While your tomatoes are roasting, make your pesto and shred the salmon into small strips. Put the water on for the pasta and bring to the boil. Once boiled, add the pasta (I used Pennette, which is just miniature Penne) and cook as advised so that it is slightly al dente. When cooked, drain the pasta and return to the pan. 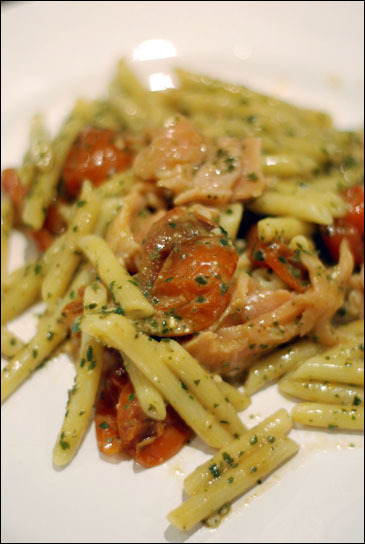 Stir in the pesto sauce, remove the tomatoes from the oven, and, taking them off the vine, add them to the pasta. Finally, stir in the smoked salmon, transfer to a large bowl and serve.